The Minister for Health has announced the restoration of their increments. 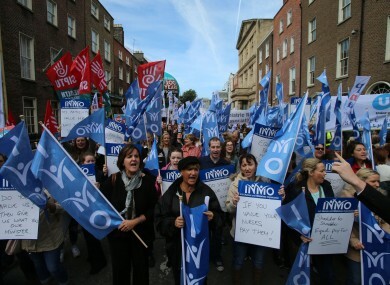 Nurses take part in a pay restoration protest at Leinster House last month. UP TO 7,500 nurses and midwives will see an extra €1,000 in next year’s total pay as certain increments are to be restored from 1 January 2017. Health Minister Simon Harris announced today that nurses who graduated between 2011 and 2015 will have their incremental credit for their 36-week student placement restored. The move has been welcomed by nurses and unions. Speaking about the decision, Harris said it was clear to him that the issue was “severely impacting on conditions and morale”. The Wicklow TD hopes that the pay rise will encourage Irish nurses working abroad to return home. “We have major challenges recruiting and retaining nurses in this country but I believe this is a small step forward. We need our nurses to stay and we need our nurses to come home,” he said in a statement. “This decision comes at the end of a long campaign to end this pay injustice and the two tier pay system that had developed and was having a detrimental effect on recruiting and retaining nurses,” added SIPTU organiser John McCamley. The INMO says that the pay rise could be up to €1,500 for some of its members. The union said the “removal of this anomaly involving the withholding of incremental credit for the fourth year of the undergraduate programme, sees the elimination of this very regressive measure which was introduced, unilaterally, in 2011″. General secretary Liam Doran gave credit to the Minister for “his work on the issue since his appointment”. Email “Thousands of nurses to see pay rise of at least €1,000 next year ”. Feedback on “Thousands of nurses to see pay rise of at least €1,000 next year ”.